Topics: Accommodation, Facilities, Reviews, and Special Offers. 12 users visit the site each day, each viewing 6.00 pages. It is hosted by Online Central Reservations Ltd Louth, using Apache web server. dns3.name-services.com, dns4.name-services.com, and dns5.name-services.com are some of its 5 Nameservers. 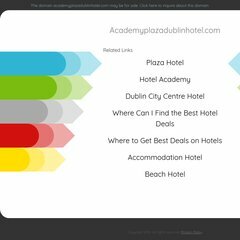 Academyplazadublinhotel.com's IP address is 78.137.162.75.